Yes we had an incident. Our boat was boarded by 4 bad guys looking to rob us. No one was hurt just a little scared. It was 0130 and we had the hatch in the bed room cracked open and propped open with a piece of PVC pipe. These 4 guys boarded the boat and three of them came to the back of the boat and lifted the hatch to see what was what. When they lifted the hatch the PVC pipe hit the floor and woke Royce up. Royce saw thier bodies framed in the hatch and came up screaming like a bear. He was very loud and did sound like a bear ready to charge. His adrenaline was pumping and when the guy dropped the hatch Royce pushed it up so hard that the hatch flew up and over and landed up side down on the steel deck with a big bang. We're talking a very big heavy hatch. Between the bear growling and the hatch hitting the deck all four guys jumped in the water and started swimming away with us screaming after them. We couldn't go after them so we just yelled at them and watched them swim away. They had a canoe following them to pick them up and there was 3 shots from the canoe. They never hit the boat but it got our attention. When we were checking the hatch over our bed we found a big machete lying on the deck. Royce scared them so bad that they even dropped there machete so they could run. The police came and took a report. 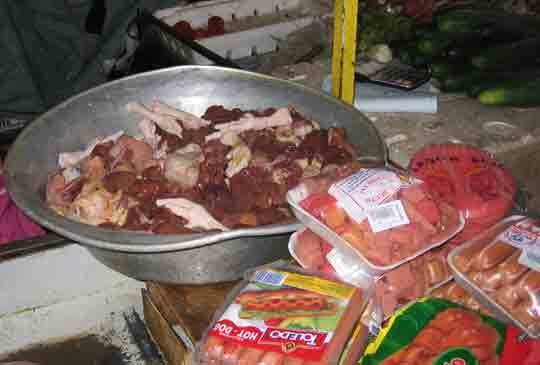 They then found out that the guys had already broken into Que Tal and ransacked it. Que Tal was anchored close to us so the guys had been watching our boat as they ransacked Que Tal. The owners of Que Tal ( Dave and Caroline Sherlock) were not on the boat at the time. The police brought in the finger printers from San Salvador and they finger printed Que Tal. They hope to have some arrests soon. Just another boring day out cruising.... We are fine but were very tired. It looks like we're going to be here at least another week or so. Royce wants to beef up our security. Not much to report. We're still in El Salvador. One step closer to leaving but still here. Since we got here the washing machine broke. Royce tried to get it fixed but the cost was to high to make it worth doing. We looked at some new washers in town and found a couple that would have work. Not the nice washer/dryer combo like I had but they would have worked. We gave the broken washing machine to a local. After we took the washing machine out there was so much room where it had been that I decided that I wanted the storage space more then I wanted a washing machine. Royce is so good with doing cabinetwork that he's building 7 drawers in that space. We're going to store our wine and canned goods. 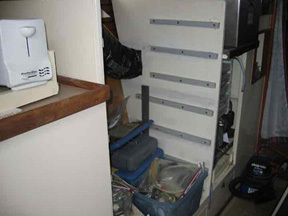 Not only do we need the space to store those kinds of things but we need the weight on that side of the boat to make up for the weight lost from the washing machine. On sail boats you have to keep the weight even through out the boat . If there is too much weight on one side the boat will lean to that side. Since we took the washing machine out we have had a list due to the weight shift. Monday we're going to make a trip to San Salvador to do the last provisioning. We're sharing a taxi with Rick and Barbara off of Kirkham Anne. This works out very well as the cost of the cab for the day is $60.00. The cab picks us up at 8 am and we usually get home about 6 pm. The cab driver that everyone uses is Jose Oserio. Jose speaks english very well and know's San Salvador. We go to the hardware stores, marine stores and grocery shopping. The best part is they have a Price Smart and Jose has a card that we can use. Price Smart is like Costco or Sam's club. They have a lot of stuff you can't get other places and the prices are good. I'm going to stock up on as much bulk stuff as we can get as we hear that Cost Rica is on the pricey side. Hopefully all I'll have to restock in Costa Rica is fresh fruit and veggies and bread if I can get it. If not bread I'll have to start making bread again. Since getting here I have not had to make bread so I'm out of practice, but it's like riding a bike. Some time next week we have to take the boat over and get fuel. We'll need 300 + gallons. I guess the price right now is some thing like $2.95 a gallon so it's going to be a big purchase. We'll have to fill up here. We hear that fuel is even more expensive in Costa Rica. Once we get fuel and food on board we're going to be ready to go. Next we have to wait for the weather to be right and we'll be out of here. It looks like the first of Oct. should be good but could be later in the month. We 're ready. We've been here since May and we're ready to see new places. I want to find a deserted Island that we can anchor in and be all alone for a while. Maybe to some diving. 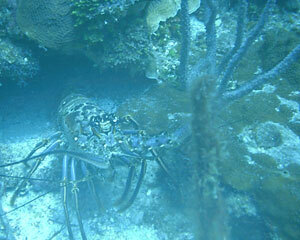 Here I am at 70 feet down with my friendly lobster. Wow hear it is the 25th and I don't have any new up dates on the web page. Well let me put it this way I did have some up dates but the computer crashed and they were lost. So let me see if I can remember what we have been up to since June 22. We took a van trip to Guatemala. There was a group of cruisers that got a van and driver together for a trip to Guatemala. It was very nice. the driver spoke excellent English and was very knowledgable about the country side. The drive was very comfortable and we learned a lot about El Salvador, Honduras and Guatemala. First stop was Copan Honduras. 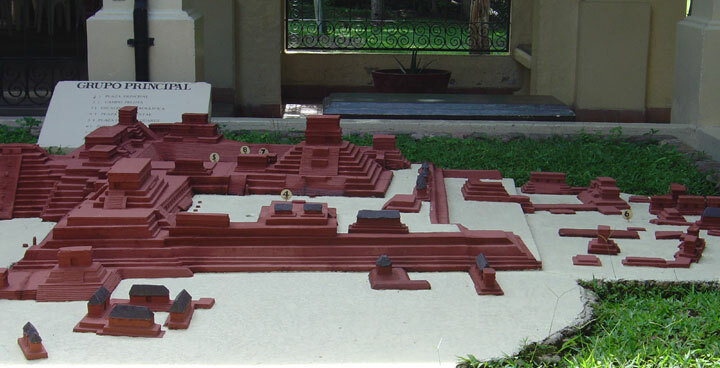 There are very extensive ruins in Copan. There was a lot of walking but it was very interesting and worth the trip. We spent one day in Copan then it was on to Tikal Guatemala. This was a much larger area of ruin's. I would have enjoyed it much better if there hadn't been such a long walk to each of the ruins. There was a mile hike from the parking lot to the first ruin, then to the next ruin there was a 15 min. walk and so on and so on. By the time we got to the tallest ruin we were to tired to climb it. I was really looking forward to getting to the top and looking out over the top of the forest canopy. There must have been over a thousand steps. Oh well..
After we all got our fill of ruin's we headed to Antigua Guatemala. Antigua is a very popular tourist area and has been since the 50's. There was lot's of shopping and very nice restaurants. We had planned to stay for a week or so but I started to get sick and was really not feeling up to being a tourist. 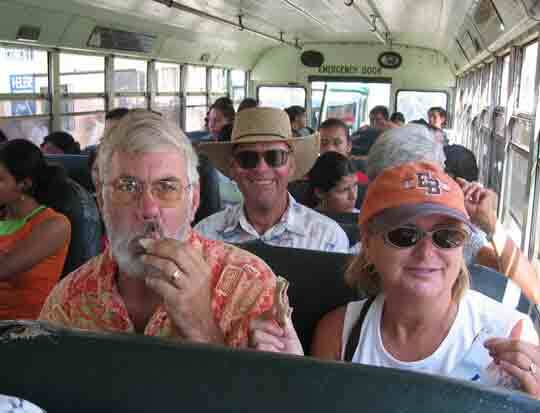 Royce was still trying to get over his flu so we took the bus back to El Salvador. It was disappointing to miss the rest of Guatemala but it was good that we went home when we did. I ended up getting much sicker. It turns out that I got a lite case of dengue fever. Thank goodness it was just a lite case as I was not feeling very good. It's much worse then the flu and I hope to never go thorough it again. Today we went to one of the largest Exotic reptile farms in the world. I made sure before we went that they did not have snakes. Did I tell you I hate snakes...... I do..... This farm raises Iguana's, chameleons, turtles and several other types of lizards that are sold for pets. There where 18 cruisers that got together to tour the farm. We took a 10 min. bus ride and walked a couple of blocks and we were there. This operation is one of the heaviest guarded business's around. They even had tall guard towers that were manned. Each pen was locked and had a guard with a key to let us in. I guess they had a big problem with people stealing the Iguanas for food. I heard they taste like chicken (go figure). Any way..... We started off with the chameleons. 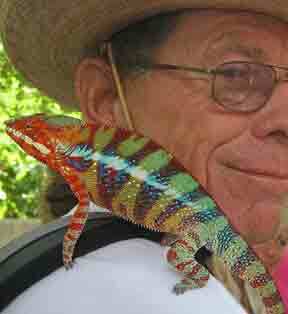 I never knew there are such large and colorful chameleons. It was unbelievable. Next we checked out some other less colorful kind of repulsive lizards (reminded me of snakes). When we got to the Iguana pins I could not believe the large numbers of Iguana's. They had thousands of Iguana's in large holding pens kind of like a horse corral. They had some tree's and shelters but other then that it was wall to wall Iganan's's. We got to go inside and herd Iguana's. It was so weird to see the ground undulate with green Iguana's. They jumped out of the tree's and ran when approached. Some of the slower Iguana's were caught by the tour guide and we were allowed to hold them. I elected not to hold one. I did touch one but that was all I was up for. If your ever in the El Salvador area I would highly recommend doing a tour of this farm. It was a $3.00 fee and we were there for 4 hours. We kept going from one pen to the next. They must have 15 different kinds of lizards. Did I tell you they also raise turtles. They had big pens of different kinds of turtles. The biggest being so big that a couple of adults in our group were able to set on one of the turtles and it went walking away with them. That's a big strong turtle. They only had like 10 of the big turtles but they must of had a thousand of the smaller kind. There is a restaurant here on the estuary that all the cruisers use. It's called Mary Sols. They have very good food and the prices are very good. It's a family run business and one of the daughters (named Teresa) is the waitress. The cruisers have become very good friends with the family. One of the things that Mary Sol's makes is pupusas. Everyone likes pupusas but no one knew how to make them. Since this is a national favorite we were all curious how to make them our selves. Teresa allowed a group of us to come to the restaurant for a cooking class on how to make pupusas. The kitchen is small so there were only 6 or 7 of us. We got to each make our own pupusas. It was much easier then I thought. We also thought there was lard in the tortilla but we found out that the pupusas are much healthier then we expected. I have not gotten to the store yet to get some rice flour so I can make some on the boat but I will. I'll let you know how they turned out. I know the one I made at the restaurant looked like a drunk put it together. It still tasted good but was not very pretty. We finally got the dive trip all put together. There are 11 cruisers going. It should be a lot of fun. We did find out that more then half the divers have not dove for over 10 years. We talked to the owner of the hotel and asked if we could use the pool for Royce to do a refresher course for any divers that were interested. There were 8 cruisers that showed up and we had a great time. I think everyone came away feeling better about diving. Oh I forgot to tell you about our night last night..... Just as we were going to sleep there was a loud bang on the deck and the boat started healing over more then usual. as we got up on deck we found that the wind had picked up to the high 40 knots range and had caught the dingy and blown it off the boat. Each night we pull the dingy up on the boat for safety. We have never had any problems with winds blowing it off the deck. It's a heavy dingy so we were over confident. When the wind got as high as it did it lifted it off with no problem. When the dingy hit the water it went up side down. that put the 15 horse power motor under water.. Did I tell you dingy motors are not suppose to be submerged under water... Yep... So any way we worked on getting the dingy turned over. It was not easy as the wind was still blowing in the high 40's and the rain was coming down in buckets. Royce finally got the dingy turned over and we were able to tie it to the side of the boat for the rest of the night. Next we had to go below and clean up the water damage due to hatch's being left open and us being to busy with the dingy to close them. Royce got up early and tore the dingy motor apart to get all the salt water out. Even with everything Royce did the motor still would not work. Lucky for us there is a local here on the Island that repairs motors. Royce got a tow over to the guys house and for $25.00 he got it up and running. After the dive class was over we got the dingy back. We now tie the dingy to the boat every night. Even if it doesn't look like it's going to storm. A lesson learned the hard way. The last week has been so busy going and coming. When we first got home from the states we did nothing for three days. We were just being slugs on the boat. We didn't leave the boat for those three days. Just laid around and read books and caught up on sleep. The next two days we ventured out to the pool. After that we were back to normal and hit the road running. The cruisers here are building a school on one of the Islands. Everyone donated money for supplies and now their in the process of tearing it down so it can be rebuilt. They had ordered sand to mix with the concrete. Since it's an Island everything has to be transported over by boat. We told the locals that we would bag the sand if they would transport it to the site. So a bunch of us went and shoveled sand into bags then a couple of the locals came and loaded the bags into their pangas and transported them to the site. 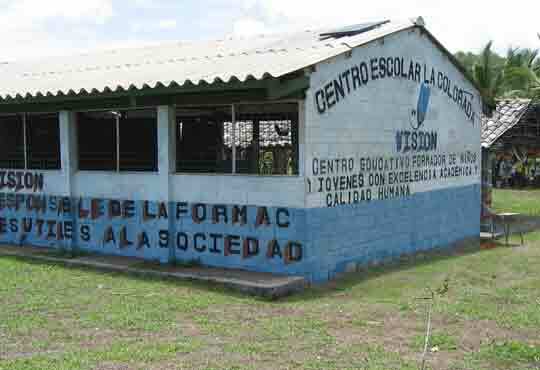 Monday we go to the school and start tearing the existing building down. After it's all torn down we'll start to rebuild. It should be fun. Some thing different from working on boats. We met some local people and had them over to the boat for drinks. They were very nice and very helpful with local information. We found out that there is a resort up the street that has a great restaurant. When we went to go check out the resort and restaurant we found that they had installed wireless Internet connection. We were told that we could use it for free as long as we buy food and drink. The problem was that no one had tried to use it since it had been installed. Royce and Caroline from Qui Tal spent 3 hours trying to get our computers to connect. Finally after we had the desk manager, their computer tech and the hotel Manager (none spoke English) get involved they got it to work. After that it was very nice to set in the open air restaurant with the cool breeze blowing in and their waiters serving us drinks all while we set and surfed the net. Of course by the time we got on the net we all had enough of computers so we checked our accounts and went home. Did I tell you it's a 20 min. trip on foot to get to the resort? Where we are is a resort area. The wealthy Sal Vadorians come to the beach and stay at the resorts on the beach. It's a 1 1/2 drive to get into San Salvador. There are a few small villages closer but all they have are small stores and when I say small I mean very small. It normal for locals to open the front room of their home and set up tables of things to sell. You can usually get bread and eggs, pop, flour, soap, etc. There is a village ( La Herradura) up the river that we take the dingy to. They have an open air market for fruits and veggies. It's a 20 min. dingy ride and a 10 min. walk. Nothing is close by here! 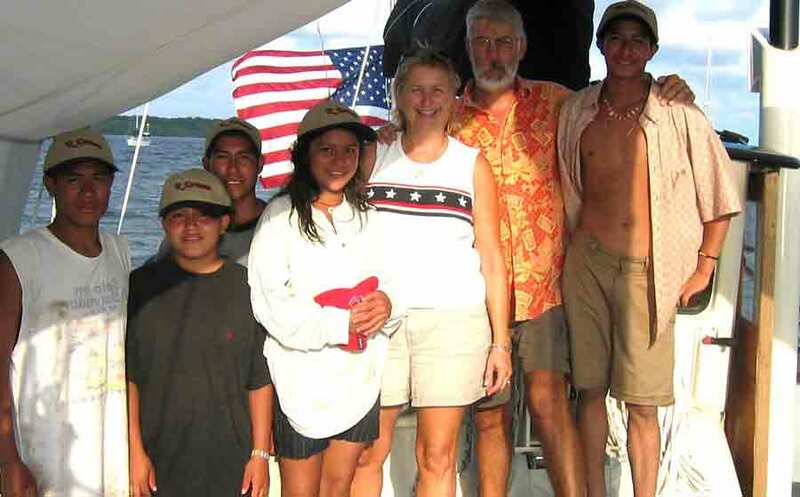 This couple also told us about a dive shop in San Salvador and that there was some good diving in the El Salvador lakes. Two days ago we took a cab into San Salvador to reprovision. While we were there we stopped in the dive shop. They are going to put together a dive trip for us. The price was half what it is any place else. For $45.00 they will pick the divers up here ,then transport us the 1 1/2 drive to San Salvador to get everyone geared up, take us to the lake, supply the pangas to get to the dive site and then bring us back to the resort. Not bad for $45.00. The lake is at the base of one of the volcanoes and is heated by the volcano. We were told that had the bottom 120 feet or so the temp of the water is 120 degrees. We will be doing shallow dives and the water temp is in the mid 80's. Royce told the other cruisers about the trip and it looks like we have 13 cruisers that want to go. Should be a fun trip. The dive is suppose to happen next Monday. After we get the dive trip out of the way we're going to be heading to Guatemala. We should only be gone 3 or 4 days. It's a 4 hour bus ride. There is a lot to see and do there but not sure till we get there. Home at last. It's so good to be back in our own bed. We really loved seeing family and friends but it's always nice to be back home. We had a whorl wind two weeks visiting Royce's family in Winchester Virginia and then on to Washington state to visit mine. The flight there and back went well. The only problem we had was on the return flight. We got to the air port in Seattle with 3 box's to check in. At check in we were told that you can only bring one box a piece. They were nice enough to sell us a duffle bag for $40.00. So Royce had to unpack the box and fit it all in the duffle bag. When we got home we found out that one of the bottles of rust off came open and everything was wet. Not bad but a pain. It was just nice to be home. Two days and counting before we get to go home. There has been a flurry of bag packing. We have finally decided to take some thing's home that have been taking up space on the boat. That equates to 6 bags to get to the air port. Should be fun. Yesterday I left Royce on the boat to work on a music cd for the cruiser kids that are having a skit Sunday. The cruisers are doing a show and dinner Sunday and the kids are doing a skit and needed some music so Royce volunteered. While he was doing that I went into San Salvador with another couple to do some last min. shopping. I found a big box of bisquick and a container of red vines licorice (that Royce loves). When your in another Country it's hard to find some things, bisquick and red vines licorice were two of those things. Yesterday we took the bus to Zacatecoluca. Try and say that name 3 times...... The bus trip was a trip. It's 1 1/2 hours give or take a few stops. At several stops along the way the driver picks up vender's that sell food on the bus. It's kind of nice since it's such a long trip. We got cold water ( the water comes in bags not bottles), toasted cashews, pupusas (these are a local specialty), peeled oranges, candy and several other thing's I can't remember right now. We had not gotten breakfast yet so Royce bought us 6 pupusas's. The pupusas's are a rice flour tortilla with some kind of filling placed in the middle The tortilla is then rolled into a ball and flattened out then fried on a hot grill. Royce likes the cheese pupusas's and I like the cheese and bean. There very good and we really have to watch that we don't eat to many as they are not a diet food. Any way back to the bus ride. The people here in El Salvador don't see that many gringo's as this is not a tourist area so there was a lot of staring going on. They are very friendly when you talk to them but the problem is no one speaks English so the conversations are not very long. There are a few thing's I understand but it does limit the conversation's. Once we got to Zacatecoluca we went to the town center by the church. They have an open air market. It's similar to the one's in Mexico but you can tell this is a much poorer area. All of the meat's are laying out un-refrigerated. There's lot's of chicken cut up or whole and they keep the gizzard's, heart's and feet in a big bowl so they can bag you up some chicken feet and gizzards's to take home for dinner. For us it was not something we would think of buying but for the local's it was normal and OK.
With the extra time we had we were able to walk thorough the village and visit with the people that lived there. We met up with Chris and Dawn on Alaska sun to walk around with. While walking past one home we were invited in to look at furniture that the man built for sale. It turned out that the man was the patriarch of the village. He invited us to set and with dawn and Chris speaking a little Spanish we had a nice conversation with him. The furniture he made was a kind of bent branch (willow) chairs and tables. After we said our good-byes we finished our tour of the town and went back to the school to wait for the ceremonies. At around 1 pm the villagers started to bring stuff for cooking. At 2 pm we finally got to eat. As none of the cruisers had eaten breakfast or lunch we were all very ready to eat. Everyone had brought some thing to add to the table. I brought deviled eggs. the village made papooses. Papooses are a tortilla with some kind of stuffing (meat and cheese) in side. The tortilla is then flattened like a pan cake and fried on a grill. They were very good and very popular with everyone. After lunch we all meet in the school while the kids entertained us. For some of the entertainment they picked some of the cruisers out to participate. I was picked to be a group of 6 women. They paired us off and gave us each a balloon. With out speaking Spanish we had no idea what we had to do with the balloon till some one showed us we had to break the balloon by putting it between two people and hugging each other till the balloon broke. The first balloon to break that couple won a prize. My partner and I won the prize. It was a lot of fun and a lot of laughs. At least I didn't have to dance like one of the other cruisers had to do. Today started out like any other day. The winds had the water stirred up a little. It was a beautiful day. The sun shinning and no rain. we had just gotten back from lunch at the hotel and laying down reading our books when Barbara and Rick on Kirkham Anne came up to the boat. Barbara said there was a problem and they needed Royce's help. They said there was a canoe with some people in it that had swamped and needed help. There was to many in the canoe for Kirkham Anne's dingy to help. They wanted us to go help with our dingy. We got into the dingy and followed. We say some people in the water. There was a lot of chop so it was hard to really see what was going on. As we got closer we saw several kids in the water waving. As we got closer we found there were 5 kids hanging onto a submerged canoe. The current was going about 2 knots and the winds had the waves up. They all looked close to panic. As we got close to the canoe the girls took a mad dash toward the dingy. We got the two girls on board then the boys were all pulled aboard. No one spoke English but we did find out that that was all of them. They were all very scared and the girls were crying. One of the girls was so scared she latched onto me and was not going to let go. We tried to talk to them and find out where they were going but just could not understand. We ended up taking them back to our boat and calling Paul and Joanne on Wanderer. Paul speaks pretty good Spanish. We found out that they were from a village about 4 miles away. It was their day off and they had come to the beach to swim. The canoe was a small dugout and they should have never gotten all 5 of them in it. We had to look at them as they were just kids and had no clue as to what kind of danger they could have gotten into. I think they found out the hard way. Kid's are kid's no mater where there from. We got the girls some dry tee shirts as they were shivering and cold. I made kool aid for everyone and Royce gave them each a RDreamz hat. After everyone was dried off and calmed down we took pictures of everyone and Royce went down and made copies for each of them to take home. Everyone was very thrilled with there pictures. Paul found out that they would have to take the canoe 3 1/2 miles up the estuary then walk 30 min. to get to there village. We all decided to take them in our dinghies as it just was not safe for them in the canoe. Paul and Joanne took one of the girls and one of the guys. We took the other three and we headed out. It was a nice trip up the estuary right up till we turned off into a inlet. Now remember they came from there village in a small dugout canoe. No problem in the canoe. In our dinghies we were feeling a bit of a squeeze. The mosquitoes started to get bad as well. Of course we didn't bring our spray with us. We were beginning to wonder when we would get there and if the dinghies were going to get stuck. I really didn't want to get out into that water. Finally we got to an area that had 3 or 4 other canoes pulled on shore. This is where they got off to start walking back home. At this point I noticed that none of them had shoes on. We asked if they were OK with no shoe in the mangrove under brush. They said it was not a problem. We said our good byes and off they went. We turned our dinghies around and we headed home. It was an exciting afternoon and we were glad it turned out so well. We met some great kids and I'm sure they were glad we were there to save them. We got through the storm with out a hitch. Adrian came in like a lamb and stayed that way. We were very glad. The winds never got any higher then 42 knots. The storm was set to hit our area at midnight to 3 am. We had everything all ready. All the stuff on the deck was battened down. All the hatches and port holes were closed. The batteries were topped off. The radar was on and tracking. Royce had put an extra anchor down to help with the holding. At about 9 pm the winds started to pick up. Nothing big, in the high 20's low 30's. It had been raining all day and continued to rain. At about midnight they weather people down graded Adrian to a tropical storm. I saw the wind hit 42 knots once and after that just low 30's. Once they down graded the storm I went to bed. The boat was set, the winds were not going to pick up so no sense waiting up. Royce ended up staying up till 2am just to be safe. Our first hurricane and I hope our last. We're expecting our first hurricane. It came in as a tropical storm and was up graded to Hurricane Adrian. At present it's off shore and about 100 miles away. They predict it to hit land about 70 miles away with winds gusting to 80 miles an hour. All the boats are getting prepared. We're taking down sails and getting anything off the deck that might blow away. It sure is nice to have prior warning. Got to go back top work. We got back from Oaxaca on Saturday. On Monday May 9th we checked out with immigration, customs and the Port Captain . This gave us 48 hours to get out of Mexico. We got back to the boat and wrapped every thing up that needed to be secured and that evening we left, heading to El Salvador. It was suppose to be a 3 night passage but so far we are on our third night and still 100 miles from El Salvador. There were 7 boats that left with us. Half of the boat stopped of in Guatemala and the rest of us kept going to El Salvador. We would have stopped in Guatemala but it was going to cost over $250.00 and we would rather save our money for some thing else. We figure we can rent a car and go see Guatemala and it wouldn't cost near as much. The trip has been very nice so far. 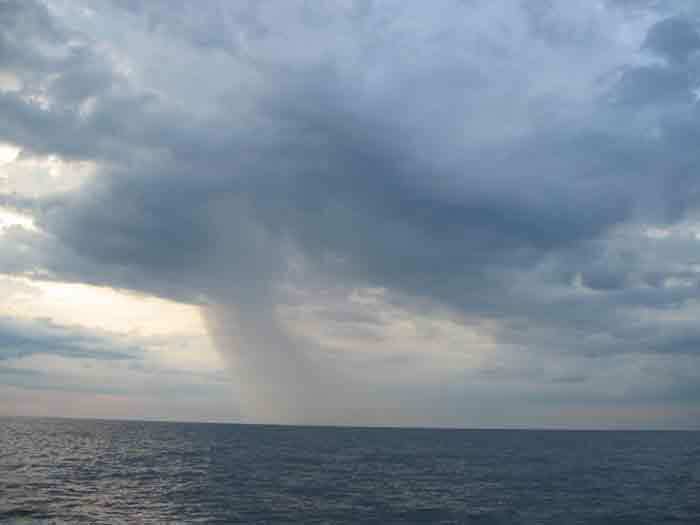 The sea's have been calm and the couple of squalls that we have gone thorough have not been to bad. We have stayed closer to land then we usually do . They say that's best with this crossing. They want the land to help keep the weather in check. 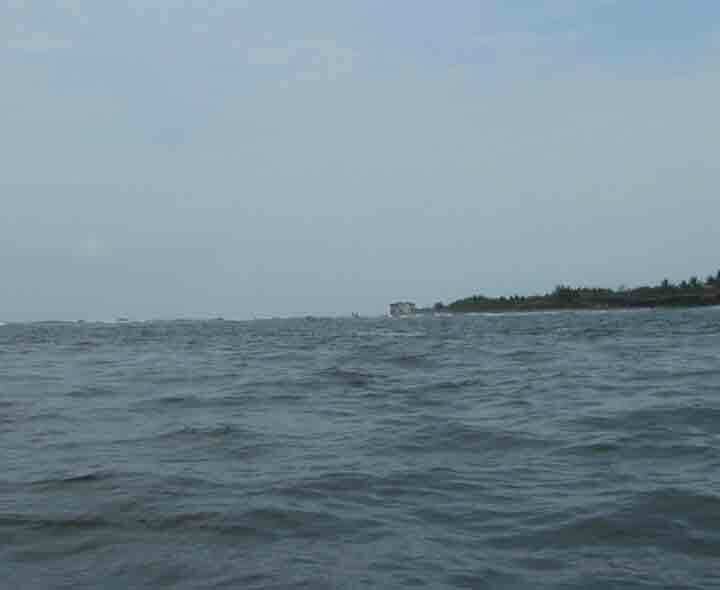 This area is know for it's rough sea's and fast moving squalls. I think we picked the right time to cross. Here's a picture I took of one of the squalls. Today were moving over to the Ixtapa Marina. It's only 6 miles from Zihuatanejo so no big move. It will be nice to be at a dock for water and power other then that I'm not looking forward to the move. The Marina also has crocodiles in the water so you have to be careful not to fall in. There are not to many cats and dogs hanging around there. The croc's will come up and grab them on the docks. I'm going to not be hanging my feet in the water, for sure. One of the boat's Passage (Jerry and Sandy) that left here lost their stern (stern is the back of the boat) anchor. You put out stern anchors to help keep the boat pointed into the swell . This helps keep the boat from rocking to much. We told them we would dive and see if we could find it. After 3 dives and using a grappling hook, on the last pass going back to our boat I found the line. The visibility was like 3 feet so I was really surprised that I say it. Royce was towing the dingy anchor and I was under water holding onto the anchor. The anchorage is only about 30 feet deep. If you got more then 3 feet off the bottom you couldn't see the bottom. It just worked out that I was less then 3 feet from the bottom when the dingy anchor went over the lost anchor line. As Royce was pulling the chain and anchor onto the dingy I went back down to see if the anchor was buried in the sand as he brought up the anchor there was a big lobster under the anchor. With thoughts of a nice lobster dinner, I tried to grab him but he was just to fast for me. Oh well maybe next time. We are still in Zihuatanejo and will be here at least another 2 weeks. The transmission is leaking and Royce had to order o rings. The people that are bringing them down here will be here on the 20th. It will probable take 3 or 4 days to make the repairs. After that we will be heading south. We need to be in El Salvador before hurricane season and it's also where we're going to leave the boat so we can fly back home. We really like this town so it's not so bad being stuck here. There are very few boats left here. Most everyone has already left. The ones that are heading south and the ones that are heading back into the Sea of Cortez. This town is the last place in Mexico for most people going back into the Sea of Cortez. The next leg south is a long 300 mile trip. When you do less then 100 miles in a 24 hour day that's a 3 day trip. We may break it up and stop in Alcapulco, not sure yet. We got the fuel we needed today. There is a panga (big heavy boat) that delivers fuel, water and beer to the boats in the bay. The guy brings big jerry cans to the boat and you have to pour or siphon the fuel into your tanks. When your getting 100 gallons or more it is a small production. we got 50 gallons yesterday and another 40 today. So now our fuel is already to go we just need the trans to be ready. Yesterday one of the boats that was heading south lost there stern ( back end of the boat) anchor over the side. They were trying to bring it in so they could leave and the line pulled out of the wife's hands. Any way that's 80 feet of heavy chain and 200 feet of heavy line. We volunteered to dive down and get it. The problem was they had already left the area so we couldn't find the chain. We ended up diving in the area they thought they had been in looking for the anchor for 3 hours. There wasn't much to see down there just some trash floating by and a lot of inquisitive small fish. The visibility was very poor and you could only see like 10 feet away from you. It was nice to get in the water again but I wish we would have been able to find the anchor. Cost wise that was a big lose for the boat but the big problem is now they don't have a stern anchor and down south you really need a stern anchor. Royce went out yesterday and bought a grappling hook so were going to go over the area in the dingy and see if we can snag it. Oh well what else do we have to do. I have read more books in the last month then I've read in a long time. I know what I'm going to be buying when we get back to the states. What a great place Zihuatanejo.... The town is much bigger then we expected. At night the lights of the town make for a very spectacular site. Of course those same lights made navigation into the anchorage after dark kind of interesting but once we were anchored the lights were very pretty. I was told that at one time there were only like 4000 people in Zihuatanejo but it has grown to like 50,000. Not on the lines of LA but for Mexico it's a good size town. They even have two big grocery stores. The biggest on is Commercial and it's kind of like Safeway back home. The other one is called Bodego and they say right on the receipt that it's the Mexican Wallmart. It would have to be one of the small Wallmart but ya it is kind of like Wallmart. I've gone to both of them and still can not get canned tomatoes or pickles. I sure know what I'm going to be buying to bring back to the boat when we go home. While we have been here Zihuatanejo has had their International Guitar festival that is put on by the local gringos. We went to two of the concerts and had a great time. The music was wonderful and we were out later then we have ever been. last night we were out till 1230 am... Wow for us that was very very late. Are we getting old or what? It's really the cruising life style. You get up at first light and go to bed when it gets dark. Most of the going to bed at dark is cause you don't want to use up all your power and lights take power. So you do get into a pattern. They call 9pm cruisers midnight. I don't remember if I told you or not but we are waiting for Dan and Michele (Ocean Rider) to get back home. There due back on April 20th. They went back to the states for Tax season. Michele is a CPA. Dan is bringing our O rings so Royce can fix the leak in the transmission. On top of the leaking trans we had our inverter go out. For those of you that don't know what an inverter is , it's what changes the household 12 volts (batteries) and changes it to 110 volts power so you can plug in your coffee makers, blenders, hair driers and stuff like that. Any way you really find out how much you use 110 volt when you don't have them. Lucky for us we had a spare inverter tucked away. It looks like we will be bringing our inverter back home with us for repair. What a pain. We hope to be leaving here around the first of May. Around the19th of April we'll take the boat over to the marina and get a slip. It will be easier for Royce to take the transmission out if we're attached to a dock. We hate to spend any more money on marina's after all the money we spent in Puerto Vallarta Paradise Village marina. I'm not going to waste it any way. I'll get all the carpets washed and scrubbed with fresh water and wash the whole boat down. I have a few rust spots that I'd like to get to that I could reach from the dock. It will be nice to have shore power as well. The little pleasures of life---power and water. We finally picked up anchor and left Bara de Navidad and none to soon as my pants were starting to get tight from all the chocolate croissants. We really like the anchorage and would encourage anyone coming this way to stop. I was talking to a boat that had stayed here during the summer and they said there was no other boats there and they had the hotel pool all to there selves and the price in the marina was much lower then any place else. I think if we were going to be staying in the area we would be looking at staying here for the summer. The only problem would be the weight I'd gain from the pastries. After we left Bara we did a short 20 mile cruise to Bahia Santiago This is in the Manzanillo bay. The water was the clearest we have seen in months. 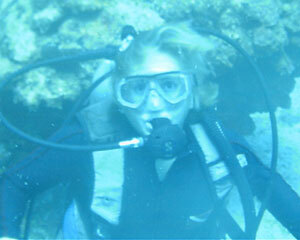 I finally got to get into the water for a dive. It wasn't really a dive but a bottom cleaning but I was in the water so not complaining to much. The water tempt has gone up some so it was not bad. I was able to get the prop all scraped and let me tell you there were barnacles on top of barnacles. It had been several months since we had done the cleaning so it was well due. When we left the anchorage later in he day we really noticed an increase in our speed cause of the clean prop. After leaving Bahia Santiago we headed for our first over night passage in a while. 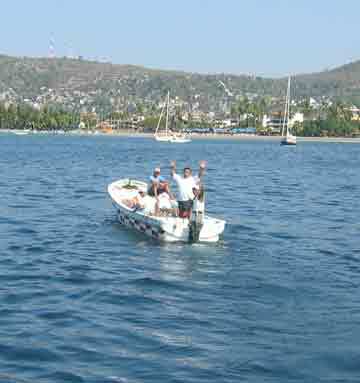 The passage to Zihuatanejo was 180 miles. If you figure that we travel at an average of 5 to 6 knots an hour that comes out to about a 30 hour trip. The trip took 36 hours due to currents and no wind. We ended up motoring all the way. Even with the motor there were times we were doing under 5. The currents can work with you or they can work against you. Other then no wind the trip was very nice and calm. The sea's were flat and there was a full moon. We got into Zihuatanejo at 10 at night. There's a large bay with hardly anyone here so there was no problems getting into the anchorage. Yesterday we went into town for lunch and to meet up with Wanderer Paula and Joanne. Paul is leaving tomorrow for a fishing trip to Alaska. Joanne will stay here in Zihuatanejo to do varnishing. What fun. One thing I forgot to mention we had stopped in Tenacatita for a couple of days. We had heard there was a great Jungle river ride that you could take your own dingy. We got 4 other boats together and had a very nice trip. The mangroves are very interesting. There is several area's where they grow over to create a canopy that you can take the dingy's under. We didn't see any thing in the water ( like crocodiles, ect) or in the tree's (other then birds). It was a nice trip and at the end we were able to dock the boats and stop at a restaurant for lunch. We got back to our boats with no problems and it was a very good day. Ok so now it's a couple of days later and I'm listening to the cruisers net and a guy comes on for some info. It appears that they had taken there dingy on the Jungle cruise. When they got back to the boat there dog got into the dingy and started pawing at one of the dingy cushions. When they went to see what all the commotion was they found a 6 to 7 inch snake. Now the question is what kind of a snake was it. The guy only said it had chevrons on it's back. Does anyone know what kind of snake has chevrons on it's back and hangs out in the tree's in mangroves? I don't have any books on snakes and would sure like to know if it was poisonous or not. Currently we're in Bara Navidad. We got here yesterday after being in the anchorage at Melaque for a week. Bara Navidad is about 6 miles from Melaque. It's all one big bay with the one towns on each end. Bara does have a Marina and the anchorage in inside the break water. It makes for a much less rolly anchorage. After being in several rolly anchorages since leaving Puerto Vallarta we are very glad to not be rocking for a while. The two towns are a lot a like as far as being very tourist oriented. The nice part about Bara is they have a French bakery that delivers to the boats in the anchorage. They have great baguettes and even better chocolate croissants. It's hard to get good french pastries down here so this is a real treat. It's good that we're only going to be here a couple of weeks as I will gain a lot of weight on these chocolate croissants. The weather the last couple of weeks has been on the cool side. During the day it's nice and warm but after dark and early morning we end up putting on long pants and jackets. You really have to make sure your back to the boat before it gets dark or you freeze on the dingy ride back. I have not been able to do any diving for over a 2 months since the water has been so dirty in the marina's. Besides the water temp has been in the mid 60's. Very cold for this area. I'm hoping as we get farther south it will warm up. I would really like to get some dive's in before we leave Mexico. We're not sure when that will be but we're heading that away soon. Hola from Puerto Vallarta. We got into Nuervo Vallarta Paradise Village Marina February 12th. Royce's Mom Elsie and Nephew Keith came to visit on the 15th. We have been so busy since then I have not had a min. to set down and write. We have checked out every shop in town and bought all the Tee shirts we can carry. The weather in Puerto Vallarta has been warm and sunny, with no bugs. Add to this Paradise Village resort facilities and we have had a great time. There are 3 or 4 swimming pools and tons of great restaurants. If your laying by the pool and get thirsty you can order a drink and charge it to your boat slip. It's just like being in the hotel. There's no need to carry money. Kind of cool but I'm not looking forward to getting our Marina bill at the end of our stay. Mom and Keith will be leaving on March 3rd. We'll be heading back out to La Cruz for a day or two then onward South. I'm really looking forward to seeing new country. We have made it to La Cruz. We got here on the 6th and have been busy ever since. There are so many old friends here that we have been social butterflies. We went to dinner the first night at Philoes. As we're setting down to dinner we saw Rick and Barbara from Kirkham Annie walk by. We made after dinner plans with them to go to the English Pub. The Pub was having a Mardi Grai celebration. When we got to the Pub we were handed beads and masks. There was a very nice band doing some great old rock and roll songs. We also met up with more friends off of Xanadue Han's and Ali. We had such a good time that we didn't get back to the boat til after 10 PM (for us that's very late). Today we went back to Philoes for dinner and music from a family of 5 playing Marimba music. the youngest was 6 and they were very good. Before the music and dinner they had a talk by a couple that are doing a circumnavigation on there sail boat. The different part of them doing this is that they are both legally blind. It was very interesting. I have to give them credit for having the guts to do some thing like that. It's scary enough out here with site I would hate to think how scary it would be with out it. The celebration is all over. We had a great time. There was lots of dancing and music. At 6pm the parade started. This parade was for blessing of the fishing fleet. We were told that since we lived on our boats we were invited to participate. There were several different groups of Indians dancing and a brass band playing the same song over and over. After the dancers came the Priests and a full size statue of the Patron Saint San Blas carried on the shoulders of 4 very strong guy's. After they all passed we joined in the march thorough town. The parade ended at the church with the Priest doing the blessing of the throat. We're not sure what the blessing of the throat signifies. (But where there) The Priest had two lighted candles that he held up to each side of your face then he said some words which we did not understand. None of our group got in line for the blessing. It was very interesting to watch even if we didn't get blessed. The church was decorated very nicely with lots of flowers, streamers and lights. While the blessing was going on the four of us, Barry and Stacy from Blue Moon and Royce and I went and got tacos from the food stands. The tacos were so good. I could feel my arteries clogging as I ate each bite. They fried the meat in lard then dipped the corn tortillas in the hot lard before they put the meat on. It was messy but oh so good. I had a carne asada taco and a choriso taco. I liked the choriso taco the best.. Chorizo for all you gringos out there is like a seasoned sausage. We don't ask what's in them, but they are very good all the same. After it got dark they had a great fire works show. We were very impressed. They had built 3 towers in the town square. They had hand made wheels of fire works that would shoot off one at a time and twirl around. Each wheel was a different item. One was a Mexican hat, one was a boot, a duck, dolphins with the final and best at the top Pegasus with wings flapping. It was very impressive. I wasn't expecting such a great show for such a small village, they went all out. We had checked out yesterday morning and had planned to leave today. When we got up this morning we found the weather report was not good. They were saying 45 knots of wind with 6 foot waves every 6 seconds. This would not be a comfortable ride so we decided to stay another day. It has rained all day so it's been very nice to just lay around and read and get caught up with my web page. We arrived at San Blas after a nice calm motor sail. I baked some banana bread and washed down the deck. We had heard that San Blas was a bad area for No-see-ums but we had no idea what we were getting into. They were awful. Tons and tons of them. We did have lots of bug repellent on board and we learned to us it when ever we left the boat. Upon entering the estuary in front of San Blas on the shore we were waved down by a kid with a big sign that said Roberto's dingy dock. We had been told this was the best place to leave the dingy as Roberto watches the dingy while your gone. We found that for $10.00 peso's ($1.00 us) you can leave the dingy, Roberto helps you tie up and helps push the dingy back in the water when your ready to leave. For another $10. peso's he'll take your garbage. They also offered laundry services but I saw how she was washing the laundry and it was not my idea of clean. There was a big plastic bucket with laundry always setting there. the water looked dirty and there was leaves floating in the water. Since there were cats and chickens running free every place I'm not to sure what else was in the water. Other then that Roberto's was a very good place to use. I was even able to bring my 5 gallon water jug in and leave it to be replaced by the water truck when they came by. I got the jug replaced for $10 pesos ($1.00 us) A very good price and it was waiting for us when we were ready to go back to the boat. 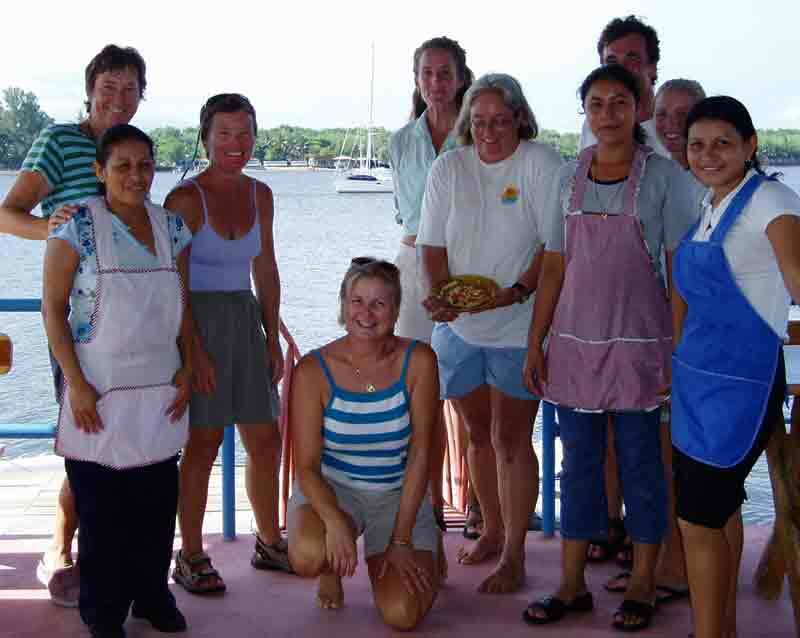 When we arrived at San Blas we found that we had arrived during the San Blas days. This is a festival to honor the Patron Saint San Blas. There has been tons of activities going on. Lots of music and dancers in the square. The big days are the 2nd and the 3rd. While we were waiting for the festivities to begin we got together with 3 other boats and we rented a panga and driver to go thorough the man groves on a jungle tour. We had a great trip. We saw lots of birds and crocodiles. There was even a crocodile farm that we got to take a tour of. We had such a good time that we all got together again with our dinghies and we went up the river for our own tour. We didn't see as many birds and there were no crocodiles but we had a good time any way. We did see lots of banana trees and coconut tree's. I would have loved to go pick a coconut or a banana but there was no way I was going to go walking around in the mangroves to get to them. Even with the bug spray I know they would have eaten me alive. In the dinghies it wasn't to bad as we were moving but if we had stopped and gone to shore, I shutter to think of it. We were finally able to leave Mazatlan. It only took 10 days to get the FM3's renewed. We had been told no more then 3 or 4 days. I guess the holidays backed them up. Anyway we got them in our hands and were checked out the same day. We loved Mazatlan but it was time to move on. We did end up staying 30 days instead of the week we had planned. Mazatlan is like LaPaz in some respects. You get there and you lose track of time. There's so much to do and see. The nice thing about Mazatlan is they have a great bus system. You can get to just about any place on the bus. They have a Sam's Club, (went there 3 times) Wall Mart (only once) and the central market. We also took in the best sites of all McDonald, Burger King and Dairy Queen yummmmmmy.. I did gain weight while I was there so it was good to go. Our trip to Isla Isabella was very nice the only bad thing was no wind. We had to motor the whole way. We did an over night, leaving Mazatlan at around 3pm. we arrived at Isla Isabella at about 9am. When we arrived we meet up with several other cruisers we new from Mazatlan, Blue Moon, Barry and Stacy, Dream Weaver Rick and Judith and GemBrit . Once we got settled in Royce and I got our dive gear out to dive the anchor. This anchorage is called the anchor eater as there is lots of rocks in the anchorage to get your anchor tangled on. We found that we were wrapped around three very big rocks and the anchor was buried all the way in the sand. The rocks were smooth so when we were ready to leave there wouldn't be any problem getting our anchor back on board. With the way the chain was wrapped and the anchor buried there was no way we were going to be slipping our anchor. We slept very well while we were at this anchorage. After everyone had rested up we all went to shore and did a hike across the Island. It was a very interesting hike. This is a bird sanctuary and the birds have no fear of you. The Frigate birds nest in trees tops that are at eye height. It was very cool to watch the mother birds feeding the baby birds. The parents and dark and the babies are snow white balls of fluff. The Frigate birds nest in the trees and the Blue footed Booby's nest on the ground closer to the shore. As we crossed over the Island we saw nesting birds every place. You had to watch were you put you hands because of the bird poop and you had to watch where you put your feet so you didn't step on the baby Igwanas. Yes there were also lots of Igwansas on the Island. After a long day of hiking watching where I put my hands and feet I was very glad to get back to RDreamz and take a nice hot shower. After a week at this anchorage we were ready to head out again. We pulled our anchor with out any problems and headed off to the next adventure. San Blas Mexico here we come. Well we made it through another year. We saw the new year in sound asleep. There were ton's of things to do but since we're retired we chose to do what we really wanted to do and that was to go to bed early just like every other day.